One time, Jesus went in to a city called Nain with his disciples. Large crowd were also following Jesus. 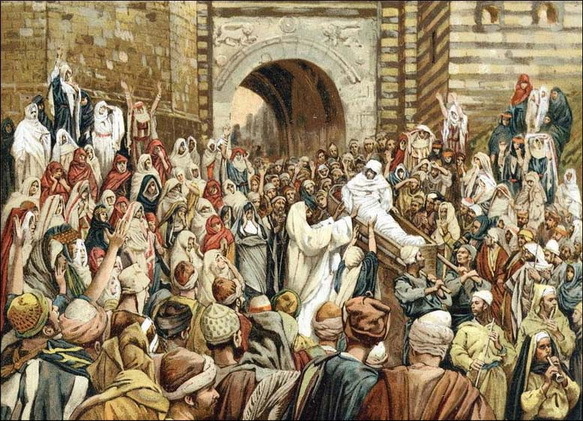 As Jesus was about to enter through the city gate, a dead man was carried out in a coffin. The dead man is the only son his mother has. Her husband is dead and so she is a widow. People were following her because her son was dead. Then Jesus came and touched the open coffin. The people who were carrying the coffin stopped and stood still. Suddenly, the dead man became alive. He started to breathe and he sat up in his coffin. The man started to talk. Then Jesus showed the man to his mother. Fear fell on everyone and they gave praises to God. The news about Jesus spread through Judea and its neighboring places. At that time, Jesus had healed many people with diseases, demonic oppression, the blind and the lame. After that, John’s messengers departed.